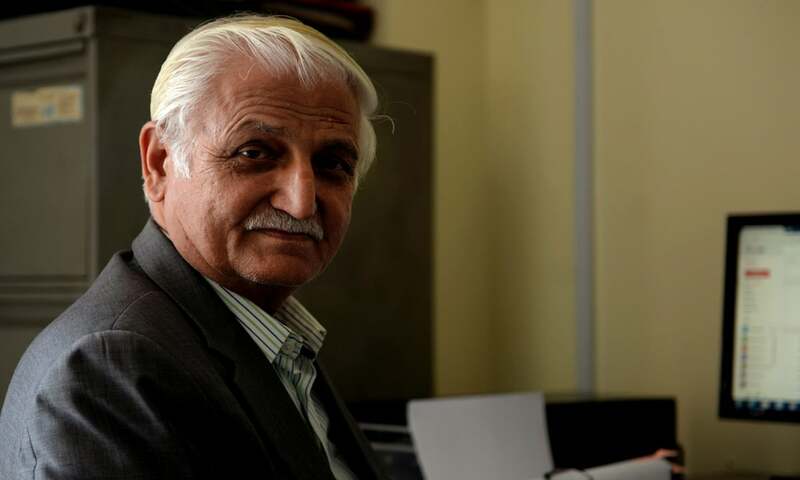 Farhatullah Babar is a man in motion, notwithstanding the slight limp he attributes to age. At 73, when most men would want to retire, his energy and appetite for work show litle sign of waning. He says he is “scattered” but he never retreats from espousing a dizzying number of causes and interests, making him intellectually focused even when physically moving. Through some stroke of luck or careful maneuvering – he insists it is luck – he has adopted a profession that is his passion, a profession he does not want to retire from. The personal has become political for him. Babar, the person, is a composite of several moving parts: a parliamentarian, a politician, a journalist, a human rights activist and a canny media manager. In the Senate, he is a legislator pushing the government to demand answers from Saudi Arabia as to why a Pakistani transgender person was killed there. Later that same day, he is chief guest at a seminar on missing persons. He has agitated the issue time and again in the Senate. “Society as a whole should raise a voice [for missing persons] because if I don’t and I disappear tomorrow, no one will stand up for me,” he says. His dogged pursuit of public interest makes him a revered politician, if not a popular one (certainly not one liked by the establishment). “He is more of an activist than a politician,” says Aoun Sahi, a journalist based in Islamabad. 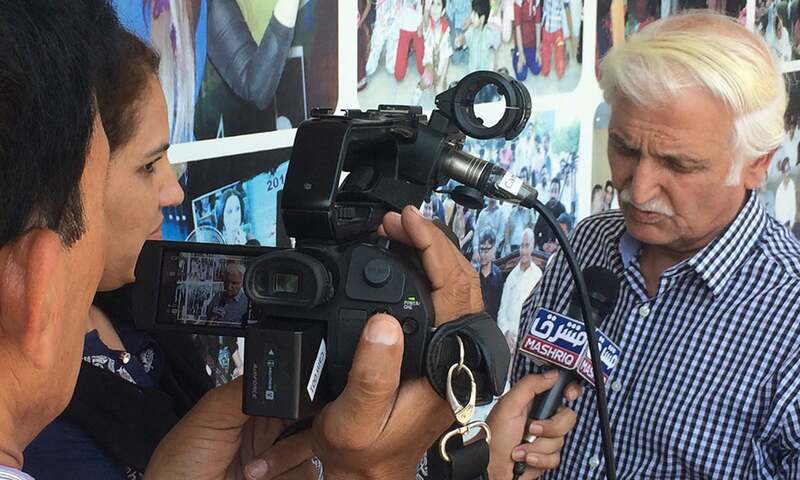 “I see him as a thinker who speaks and acts along philosophical lines.” Sahi believes it is Babar’s hardline stance on issues such as the enforced disappearances of anti-establishment bloggers and tweets by the Inter-Services Public Relations (ISPR) on non-military subjects that explains why he is not seen “on electronic media which is right-leaning and pro-establishment”. Others find him bureaucratic — available between 9 am and 5 pm only. He does not socialise with journalists after hours. Babar’s socialising is selective by design, his time carefully managed. When not participating in public events, he is beavering away in his study, making notes, writing briefs or press releases and preparing for the Senate sessions, in anticipation of another frantic day. Information made him the man he is. He seeks it and does not treat it lightly. When Babar retires from the Senate, he may sit down and write the book he has been wanting to. Given his long association with Pakistan’s turbulent politics, one could expect original insights from him. But in keeping with his modest nature, he will not be the subject of his book. He would rather write about Munir Ahmad Khan, the founding chairman of the Pakistan Atomic Energy Commission (PAEC). Nicknamed ‘Reactor Khan’, he was a Pakistani nuclear physicist who headed the reactor division at the International Atomic Energy Agency. He met Zulfikar Ali Bhutto, then foreign minister of Pakistan, in Vienna in 1965 and alerted him to India’s nuclear ambitions. When Bhutto became president of Pakistan, he brought Khan back to Pakistan in 1972 to embark on a crash programme to develop an atomic bomb by 1976. As the PAEC head, Munir Ahmad wanted an information assistant with a “science background”. Babar, a qualified engineer who had joined the Press Information Services in 1970, was tailor-made for the job. Working with Khan between 1973 and 1976 (and later between 1979 and 1981), he learnt a great deal about nuclear weapons and politics. “I may not have known what was being made and where but I knew something was brewing,” he says of the time when Pakistan, in Bhutto’s words, was “at the threshold of full nuclear capability”. Babar’s two stints at the PAEC shaped his views on nuclear weapons. His work there prepared him for an era of intense nuclear politics when he joined a resurgent PPP after Zia’s death. It was the age of the Pressler Amendment that required the American president to annually certify that Pakistan did not have nuclear weapons in order for Islamabad to receive aid from Washington. Pakistan was simultaneously engaged in a race to develop its nuclear deterrence, finally conducting multiple tests in May 1998. Babar finds nuclear capability combined with nuclear chest-thumping reckless. As a senator, he persistently pushed for an investigation into allegations that Pakistan was transferring nuclear technology to Iran and North Korea during General Pervez Musharraf’s era — something the military dictator later conceded in his book. “My basic contention is that nuclear weapons have great power and, therefore, need to be handled with great responsibility,” he says and is not starry-eyed, as many in Pakistan are, about nuclear weapons being the “panacea for our development and security anxieties”. We forget that the Soviet Union had so many nuclear weapons that it ran out of space to store them, he says. And yet it collapsed like a house of cards under the weight of its economic and political problems. Shafiqa Ziaul Haq, the military dictator’s wife, left for the United Kingdom for an eye surgery in 1986. Amid rumours that her visit was sponsored by the state, cartoonist Feica drew her caricature for The Frontier Post, an English language daily published from Peshawar. It showed a plump lady pulling a donkey laden with gift boxes. Babar was the newspaper’s managing editor. He sat with Feica to insert a line under the cartoon. It said aik ankh kay isharay say qaflay rah badal jatay hain (a blink of an eye can change the course of a caravan). The line suggested that even Zia, the fearsome autocrat, was not above indulging his better half. After the cartoon was published, a livid Zia reportedly called the late Majid Nizami — the influential right-wing editor of Lahore-based Urdu daily Nawa-i-Waqt who was also a former president of the Council of Pakistan Newspapers Editors. Zia told Nizami that he had always defended the Post but he, Zia, would not hear of it anymore. Babar was the face of the newspaper. He would receive diplomats, foreign correspondents and officials that the Post drew in droves because it was the only paper covering the Afghan war from the ground up, with ready access to sources and information on both sides of the border. To helm a left-leaning newspaper under Zia’s dictatorship, in the middle of an American-inspired religious war in Afghanistan against an avowedly leftist Soviet Union, was a “stirring experience” as some of those associated with it recall. Not least because the newspaper provided a telescopic view of the Cold War gone hot from a proximate base in Peshawar. But what really put the newspaper in Zia’s crosshairs was its fierce opposition to martial law. To this, the Post added an overtly Pakhtun nationalist posture on regional issues and politics, advocating provincial autonomy and opposition to the Kalabagh Dam that Zia wanted built. It also serialised Pakhtun nationalist leader Khan Abdul Wali Khan’s biography, Facts are Sacred, that challenged the establishment’s view of his father Khan Abdul Ghaffar Khan, also known as Bacha Khan, and his ‘Khudai Khidmatgar’ (also known as the Red Shirts) movement as villains in the struggle for Pakistan. For Babar, his stint at the Post was something of a homecoming — in more than one way. By 1981, he had been feeling stagnant at the information ministry where he was also being “discriminated against”. His foreign posting to Turkey as press attaché was cancelled, leaving him disgruntled. He took leave to go to Saudi Arabia where he worked as a “typist” for some time even when originally hired as an engineer at Dallah Avco, an aviation services company. Within months of his joining, he found a note on his desk saying he had been promoted to manager of the Royal Saudi Air Force bases operated and maintained by Dallah Avco. He would jet around in the company’s chartered plane to visit bases put under his charge. When he came back from Saudi Arabia, he did not rejoin his information ministry job. He instead joined the Post. The newspaper brought him back to the business of information. It afforded him an experience that journalists of that era look back at with bittersweet nostalgia — working with a professional editor (the late Siddiqui) and at a time of great turmoil in the country and region, no less. It was his time at the Post and victimisation at the hands of Zia that turned Babar into a “political animal”, says his cousin Shahidullah Babar. “He was never into politics otherwise.” While the newspaper politicised him, working with an editor who stood up staunchly for human rights turned Babar into an activist. The Post was given to regular “transgressions” that other newspapers would not dare attempt, breaking sensitive news like the arrest of Pakistani soldiers by Afghan authorities in June 1988, shortly after the Soviet army had started withdrawing from Afghanistan. Once the story appeared, owners of the Post told Babar about “pressure” from Hamid Gul, then the head of Inter-Services Intelligence (ISI), to let certain staff members including Babar go. He volunteered to resign, stuffing his effects in a cardboard box and driving off in his car. When she returned to Pakistan from exile in 1986, she knew that the Post had stood by her during her struggle against Zia and wanted to have an interview with the newspaper during her visit to Peshawar. For Babar, it would herald a quiet initiation into the inner sanctum of the PPP. The interview over, she invited him to her wedding in Karachi in December 1987. Benazir delivered the speech he wrote in the National Assembly. It paid tribute to people for the triumph of their peaceful democratic struggle that had led to the election of a woman, first time in history, as the prime minister of a Muslim country. Soon he received another request for writing a speech for her and then it became a routine. Babar’s detractors may say that he got the job because Benazir wanted to reward pro-PPP journalists but there was more to his appointment than that. He brought with him expertise indispensable to anyone seeking to establish themselves politically after a long, debilitating spell of dictatorship. Benazir, who had little understanding of how the civil administration and officialdom worked, appreciated his insider knowledge and understanding of the bureaucracy. “He knew the state machinery and his advice came in handy for Benazir, who was starting from scratch,” says Hoti. When Benazir’s brother Mir Murtaza Bhutto was killed in a shoot-out with the police in Karachi in 1996, she sent Babar to receive her mother, Nusrat Bhutto, who was flying in from abroad. He received her at the Karachi airport and told her about Murtaza’s death. “She looked at me and said, ‘Babar, I had made you some pickle but Benazir ate it all. Don’t worry, I will make you some more.’” Her dementia was at an advanced stage by then. When it comes to Babar’s association with the Bhuttos, observers often point to the Naseerullah Babar connection. The late general was an advisor to Benazir Bhutto during her first stint in power (1988-90) and interior minister during her second tenure (1993-96). The two men are related. They come from the same Pakhtun tribe that has roots in Afghanistan but is now scattered in many places in Khyber Pakhtunkhwa and Balochistan. They also belong to the same village: Pir Pai, in Khyber Pakhtunkhwa’s Nowshera district, that is known as chhota valayat (Little England) for its verdant fields, old brick houses with arched doorways and neat streets. Its largely literate community includes many eminent civil and military officers, some having started their careers as far back as the British Raj. But these connections with Naseerullah Babar have little to do with Babar’s professional and political trajectories. Babar first met the PPP founder and the then Prime Minister Zulfikar Ali Bhutto in 1977 at the Governor House in Peshawar. At the time, he was working as director information in the North-West Frontier Province (now known as Khyber Pakhtunkwa). It was unusual for a junior officer of his rank to have an audience with the prime minister. Bhutto only heightened his unease by asking him to share his views about a local journalist as an aide to the prime minister thrust a pen and paper in Babar’s hand. There was an impression in official circles that the journalist was close to Sardar Mohammad Daud Khan who at the time was the president of Afghanistan and was staunchly anti-Pakistan. 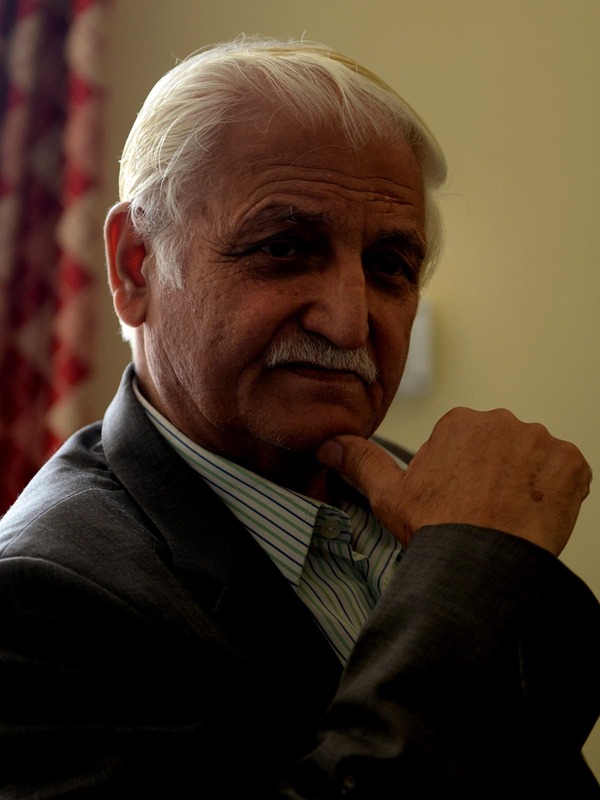 “I said, yes, [he is close to Daud] but far from being a spy, he is a patriot.” The journalist was later recognised by the Bhutto government for helping foster good relations between Kabul and Islamabad. Next time Bhutto met Babar, he had another unusual favour to ask: he needed him to teach Pashto to Nusrat, then first lady. 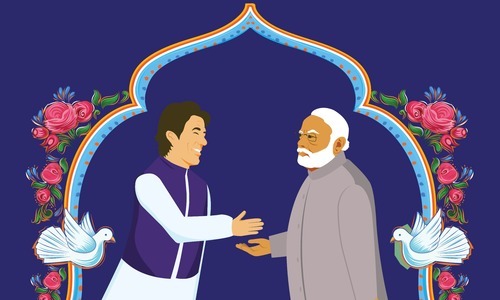 “She was scheduled to visit the provincial assembly in the North-West Frontier Province and needed to learn the basics of the language,” he says. Nusrat appeared extremely sad, but not angry, to Babar. “Once she told me, with great sadness, ‘Farhat, I can’t forget how excited Bhutto was on the evening he told me he had found a new army chief.’” That army chief, Zia, would eventually hang him. The PPP’s media office in Musawat Building in Islamabad’s Zero Point is a quiet place these days. When Benazir was abroad during Musharraf’s regime, the place was the throbbing heart of the party’s politics. Conveniently situated in what is the federal capital’s Fleet Street, that houses private media organisations as well as the state news agency, the office has the air of an old press club where reporters and party workers talk politics over tea. When Babar is not in the Senate or at the PPP secretariat, this is where he works from. After Benazir’s second government was sent packing in 1996, she asked him to manage the party’s media affairs. In time, he would become both her advisor and spokesperson. Babar’s team at the media office is composed of men who put the “people” in the PPP. Call them jiyalas or peopliyas. Whatever name they may go by, one thing is certain: the commitment of these working class activists to the party is incontrovertible. Brought up in Peshawar’s Nishtarabad area, along with eight siblings in a house that had two rooms, Babar can identify with the working-class ethos of his office. His father was a school teacher and a disciplinarian who earned only 225 rupees a month back in the 1950s. The threat that he “would not pay [our] fee if [we] failed was his way to ensure we took studies seriously”, says Babar. There was a “sense of deprivation but it had a positive impact”, pushing him and his siblings to excel in their studies. 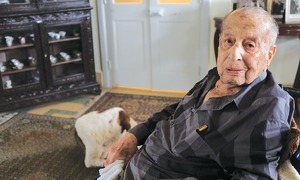 Babar recalls the time when he cockily donned a turban, a walking cane in hand, to appear for an interview to join the army in 1961 just to “prove myself”. He got selected but decided not to join as he was also accepted into the University of Engineering and Technology, Peshawar. Babar’s politics is steeped in working-class values. He drives his own car and buys his own groceries — unusual for someone counted among the “ruling elite”. A self-made man, he offers perhaps a better clue to his personality through his work ethic. “He is as willing to do the work of a clerk as well as of a manager,” says Zia Khokhar, his colleague at the media office. 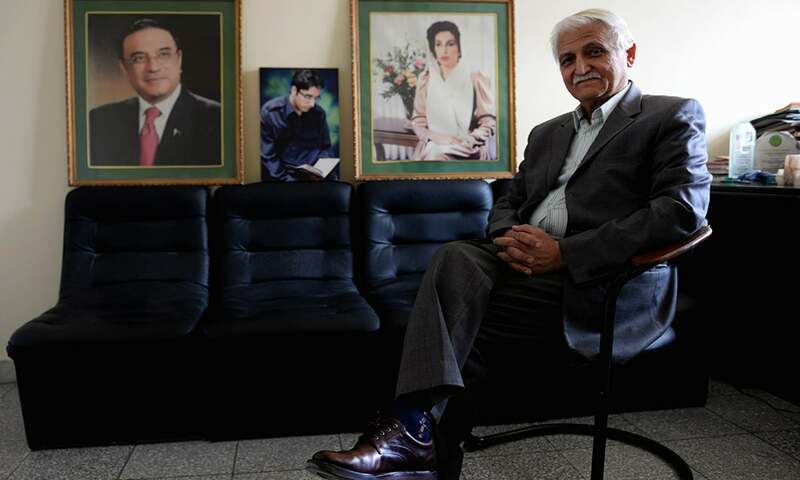 To those outside the party, such as Abdul Rauf Khan, a former senator from the Pakhtunkhwa Milli Awami Party, Babar lives the PPP’s awami ideals. An Islamabad-based political analyst, who has known Babar for long, speaks jokingly of his journey from “civil engineering to political and social engineering”. Babar, he says, is from the generation that came of age in the progressive ethos of the 1960s and believes in politics based on ideas and driven by civil rights. But Babar has not been able to develop an electoral constituency of his own, which leaves it to the whim of his party leadership whether or not to give him an elected or government post. He, however, has considerable clout with the party leadership that helps him in his parliamentary and legislative endeavours. This clout lends him great cachet in policy matters — minus the distractions of managing and maintaining a constituency. Elected to the Senate as a technocrat, he says he is not technocratic in the sense an economist or an accountant is. “I am not an expert as, say, [former caretaker prime minister] Moeen Qureshi was. But I do go into the technicalities of issues I take up,” he says. It is his tendency to go “into the technicalities” of issues such as foreign affairs, civil-military relations, rise of religious extremism and militant violence, erosion of democratic space and political authority, and the intrusive and unregulated role of intelligence agencies in political and civic life that make the establishment and the government squirm when he speaks in the Senate. In demanding parliamentary oversight on these subjects, he displays a schoolboy’s enthusiasm that is both daring and rebellious. During his first stint as a senator, beginning 2003, a number of parliamentary instruments moved by the PPP – such as an inquiry into the Kargil War and probes into the chronic civil-military imbalance that had caused dismissals of elected governments – were scuttled by the Musharraf government. To make public the “security establishment’s reluctance to provide answers”, the party published a pamphlet titled Killed in the Chamber authored by Babar. It asked among other things: Whether a military officer declares assets as civil servants are required? Does the ISI work under any law? Was an inquiry conducted into the Kargil War? “The answer to all these questions was ‘secret and sensitive information that cannot be shared with the parliament’ and therefore [the questions were] killed in the chamber,” says Babar. Even when his own party was in government – from 2008 to 2013 – it failed to provide answers. In fact, it failed to find the answer to a question even more fundamental to its existence: who assassinated Benazir in December 2007? He attributes the failure to an “all-pervasive interference of the security agencies” and says that this interference is “so deep, no matter who is in power, that [the governments] find themselves handicapped”. He recalls Benazir once telling him about the deep state, the establishment, that “unkay moonh ko khoon lag giya hai (they have tasted blood)”. She said the authority could be retrieved from the establishment only “by working within the system”. He is happy to keep chipping at it, one move at a time. This working ‘within the system’ has often led the PPP to endorse undemocratic moves – sanctioning military courts twice in the last two-and-a-half years, for instance – that makes it look like Babar’s party is betraying its own ideals. “[It] champions the rights of people but [has] ignored [the fact] that regional conflict and hegemonic policies towards neighbours [such as Afghanistan] also impact people’s lives and peace,” says Abdul Rauf, referring to the PPP’s nurturing of Afghan Taliban back in the 1990s. Yet Babar does not walk out in such circumstances because, according to Rauf, he is committed to “the party’s ideology, not to power”. Once when his cricket ball landed on a neighbouring roof, a young Babar cheekily pasted a note on the neighbour’s door to stake his claim. “There is a ball on the roof of this house and it belongs to the president of Pakistan,” it read. The closest Babar would come to achieving that childhood ambition is when he became spokesperson for President Asif Ali Zardari during the PPP’s last stint in power. It was no child’s play. The government and the party were under attack from multiple sides. The courts embargoed Zardari from taking part in politics and sacked Yousuf Raza Gilani, the party’s prime minister. There were serious differences between the government and the establishment, mainly over Pakistan’s relationship with the United States. The opposition was also ascendant, the press usually hostile and many of the government’s economic policies highly unpopular. Many men at the very top were mired in allegations of corruption. And to top it all, Zardari’s larger-than-life negative image was perceived to be lurking behind every shady deal, every suspect policy, every mysterious political move. Babar was in the line of fire even from party loyalists. Like some of the PPP’s old guards, he too once questioned Zardari’s influence and reputation due to all the bad press he brought to the party. Perhaps it was his apprehension that the party would change under Zardari’s leadership that made Babar tender his resignation soon after Benazir’s death. His detractors say he was unhappy with the lacklustre interest the party had showed in his unsuccessful bid for a Senate re-election in 2006. About 10 PPP legislators in Khyber Pakhtunkhwa’s provincial assembly, his electoral college, are said to have voted against him. Zardari, however, turned down his resignation, bringing him back to the Senate in 2009. Babar may not have always been successful in defending Zardari but he at least came out of power unscathed. “There are a lot of allegations against Zardari whereas the person who represents him is completely clean,” says the political analyst. Yet his friends, family and political observers wonder how he reconciles his work as the spokesperson for arguably the most infamous politician in the country with his politics of principles. Isn’t it contrary to his character to speak for someone who does not reflect his own principles? Zardari’s choice of Babar as his spokesperson seems deliberate because Babar compensates for what his boss lacks: he is credible and commands respect. To have as his spokesperson a “man of principles” whose position on nationally important issues is well-articulated and hinged to the PPP’s ideological framework is a godsend that Zardari would be foolish to spurn. Babar himself seems to believe that Zardari is not as bad as he is made out to be. He is “more sinned against than sinning,” he says. That the PPP survived three military dictatorships, sustaining country-wide support since 1967, is often highlighted to criticise Zardari’s politics which has limited the party to Sindh. Some observers worry about Babar’s legacy — and that of others like him. What happens if he leaves or retires tomorrow? Has he strengthened enough the “dissenting space” he represents in the party to last after his exit? Babar’s response, typically modest, is that “individuals really don’t matter much” and that it is disadvantageous for parties to become “individual-centric”. The PPP has an ethos in which there will always be voices to steer it back on course if and when it deviates from its ideological moorings, he says. This was originally published in the Herald's September 2017 issue under the title "A man of ideals". To read more subscribe to the Herald in print. I don't know the guy, but I know his children. They are down to earth, honest people. How one raise their children reflects on their own personality, in my humble opinion. Great going senetor. You have raised correct and sane voice against all odds. Hats off to you. Babar no doubt an able person, but his association with scoundrel tarnished his image. A few framed pictures next to Babar have invalidated entire story. Beautiful words written for a person who is worth all this praise. Being his daughter I can just say that this self-made man let his very ordinary kids sail in hardships only to make them extraordinary. No doubt deep inside we had expectations from him but he had plans of letting us grow and evolve ourselves, just helping our faith to grow and he succeeded.